Earlier this week I had the privilege of attending Jonny Draper Photography's creative lighting workshop at the stunning Owen House Wedding Barn. This was a great opportunity to try out some new lighting techniques as well as meet some awesome photographers! I love to do a couple of workshops throughout the year to keep me inspired and moving forward creatively, Now I'm raring to go for my 2018 weddings with lots of ideas and inspiration. Here is a run down of the dream team that put this AWESOME workshop together: Owen house wedding barn in Cheshire provided a striking backdrop for the shoot. 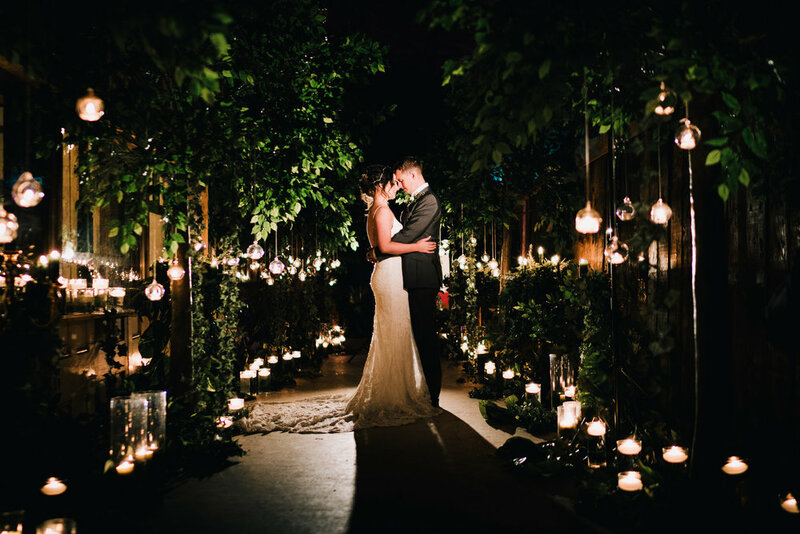 The stunning trees and foliage beautifully lit by candles and hanging tealights were supplied by Manchester based Red Floral Architecture. Epic Lighting setups from Luminate Events. Neon Love letters from Love lights the way. Our gorgeous models and real life couple Fiona & Andy braved the cold barn and were great sports! Fiona's elegant dress was expertly selected by Emma (who also happens to be Jonny's wife) from Love bridal boutique, Altrincham. While Andy's dapper blue lounge suit was from Whitfield and Ward in Wilmslow. Not forgetting our talented make up artist Sarah Meredith Make up & Hair styling. Thank you to Jonny and his team for this amazing workshop and styled shoot.